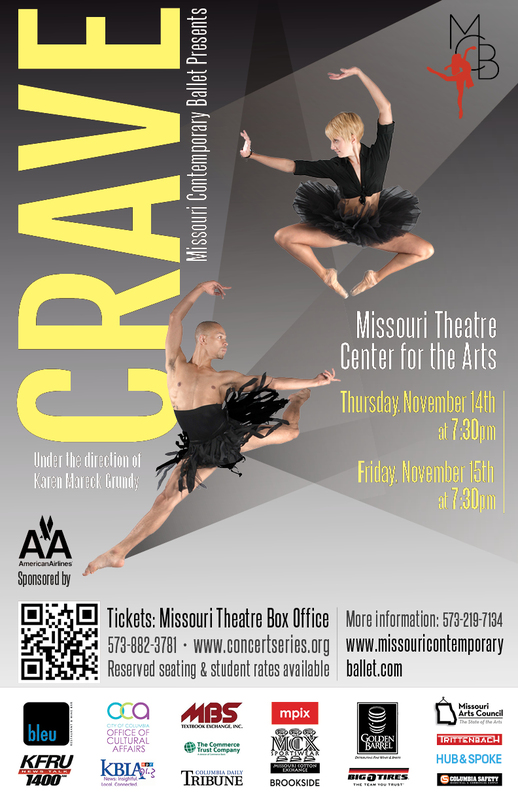 You’ve seen Missouri Contemporary Ballet (MCB) take the stage in the past, but this time they won’t be doing it alone! MCB is proud to present “Connectivity,” an artistic collaboration with Island Moving Company (IMC), a contemporary ballet company from Newport, RI. MCB first joined forces with IMC in July 2012 when they traveled to Newport, RI to be the Resident company of IMC’s Great Friends Dance Festival. To continue and further the artistic relationship, IMC is traveling to Columbia to perform on MCB’s home turf. “Connectivity” will feature three works from MCB’s past repertoire and one new work. • Twisted has always been a fan-favorite. Choreographed for MCB’s first season, this piece is based on the classic game ‘Twister’. • Falling Apart originally premiered in 2009. Featuring the athletic women of the company, this work explored the deterioration of a dancer, both physically and mentally. • Tango de Muerte was also created for MCB’s first season. Choreographed by nationally known Tiger Martina, this piece follows two people who die tragic deaths and meet in the afterlife. • Catch’Up by company member Fernando Rodriguez will debut in this production. Rodriguez explores the idea of someone who tries constantly to fit in, but ends up missing out on life, only to catch the falling pieces of the lives of others. Island Moving Company will be bringing three works, performing two in each show. • Struggle For Comfort is a heavy work choreographed by Artistic Director Miki Ohlsen. • Pheromone was first performed at the Great Friends Dance Festival 2012. It explores the stimulating sensuality and the natural uninhibited interactions among human beings. • In the Beginning is a new work choreographed by Mark Harootian, a member of Festival Ballet of Providence. You’ll want to be part of this race occasion joining two American dance companies from vastly different parts of the country in a celebration of the human connection. Join Missouri Contemporary Ballet and Island Moving Company as they strengthen their artistic relationship! For tickets, call 573-882-3781, visit the box office, or click here. Many thanks to Joanne Sandorfi with the Missouri Contemporary Ballet for submitting this guest post. Don’t miss these wonderful performances! 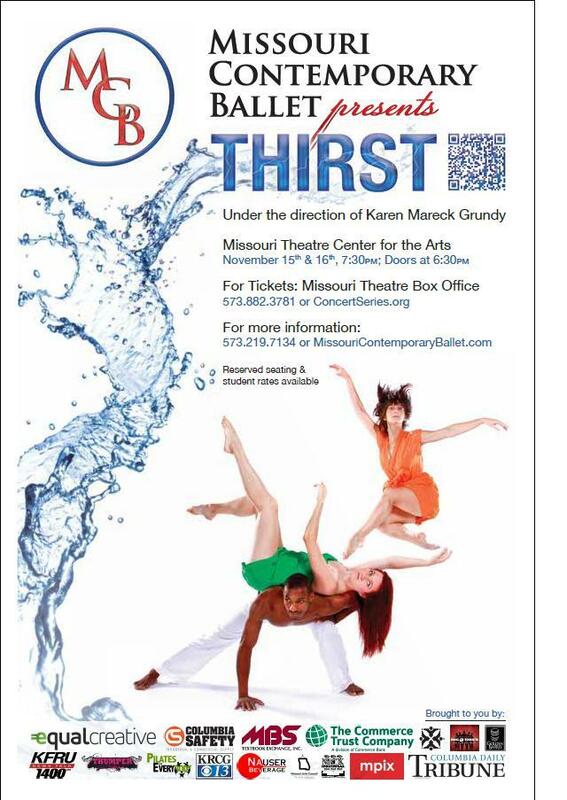 Missouri Contemporary Ballet is proud to present its seventh annual fall show, THIRST, at Missouri Theatre Center for the Arts. THIRST will feature six works, four of which are world premieres. With a wide variety of dance and music, this family friendly show has something for everyone to appreciate. Missouri Contemporary Ballet’s Resident Choreographer, Shannon Lee West, will be debuting her new work, proximity, which was created for the whole company. In this piece, West’s choreography exploits the ideas of boundaries, apathy, and intensity. A fourth piece was developed by New York-based guest choreographer, John-Mark Owen. This new piece, minore al maggiore (minor to major), is a balletic exploration of sculptures compelled by a musical narrative. The ballet derives from an image that Owen created for his feature-length ballet, Requiuem. He departs from the original purpose of that image and explores what else can come from one sculptural moment. Owen charges raw human emotions through various perspectives on states of being, finishing the ballet with a tender pas de duex that is optimistic and ethereal. Missouri Contemporary Ballet’s Artistic/Executive Director, Karen Mareck Grundy, set a solo on company dancer, Elise Eslick. Set to a quivering melody sung in Spanish, this work will portray the seductive, mournful song of dark, off beat artistry. Utilizing Eslick’s pure strength and beauty, this piece showcases that dancers are not just artists, but athletes as well. The show will close with Grundy’s new work, 1000 Details. Set to music by Trent Reznor and Atticus Ross from ‘The Girl with the Dragon Tattoo,’ Grundy wanted to create a piece that was just movement for movement’s sake. Evident by its title, this powerful work is fast paced and extremely detail oriented, much like Missouri Contemporary Ballet’s Unbreakable Code, which Grundy choreographed in 2006. There are two nights of performances, November 15th & 16th, 7:30p at Missouri Theatre Center for the Arts (203 S. Ninth Street). Tickets are $19-$29 for adults, $9.50-$14.50 for high school and college students, and $12 for children 12 and under. Student tickets are an additional half-off ($4.25-$7.25) for the Thursday, November 15th show. Tickets can be purchased at the Missouri Theatre Center for the Arts box office, 573-882-3781, or by visiting http://www.concertseries.org/event/mcb-fall-ballet/.